The Pacifica Ukes ukulele ensemble from Campbell River is a unique musical group which has earned a reputation both locally and abroad for their versatility and quality of their musical performances. The ensemble is comprised of two groups, a younger Junior "A" Ensemble with students from grades 6-8, and a Senior "A" Ensemble with students from grades 9-12. 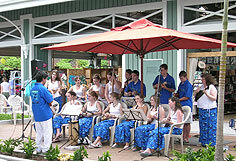 In total, there are approximately 30 students involved in the Pacifica Ukes "A" program. In addition, a "Junior Strings" group for students in grades 4-5 has been established in 2012 to facilitate entry into the Pacifica Ukes program. 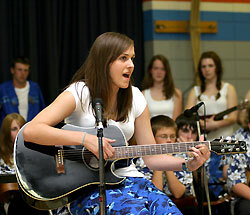 Amanda performs her own song at the year-end concert. Both "A" groups have performed extensively at local schools and various public events and venues throughout Vancouver Island and the Lower Mainland. The Senior "A" Ensemble has made its mark in the musical world, playing to audiences at the B.C. 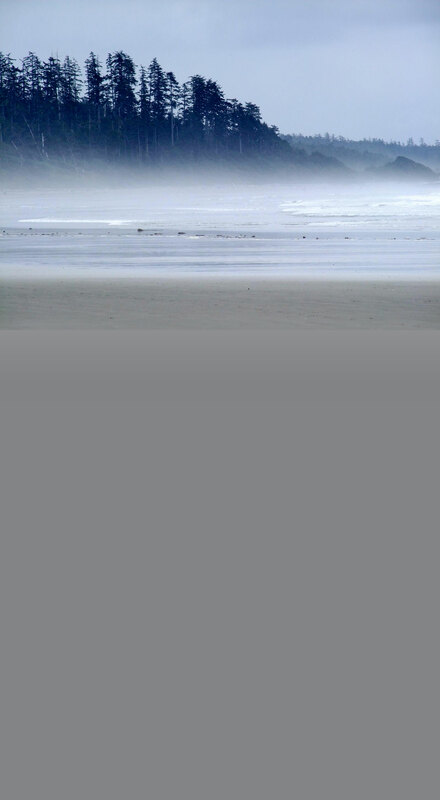 Festival of The Arts, the B.C. Ukulele Conference, Kelowna School District Music Festival, and at the Pacific Basin International Music Festival in Hawaii. To its credit, the group has released three audio cassettes and four CDs, the latest album released in April 2013. Seniors perform at Ukefest 2007. Each performance presents the audience with a diversity of musical selections from traditional Hawaiian to Classical and Contemporary, including Jazz and Pop styles. This diversity makes the Pacifica Ukes a highly versatile group with wide audience appeal. Balanced with additional accompanying instruments, the group offers a subtle blend of delightful light entertainment for audiences young and old alike! Pacifica Ukes perform at Kona International Mall in Kailua, Hawaii. 1) To provide an opportunity for students to grow musically and personally by participating in ukulele performance ensembles. 3) To promote community awareness of the ukulele program by encouraging the student groups to perform often for community events and organizations. The group performs as the Pacifica Ukes from Campbell River. 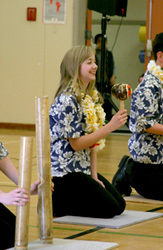 Montana plays the 'uli 'uli shakers at the year-end concert. 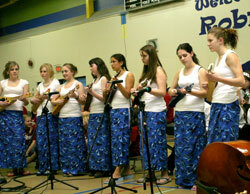 The "Pacifica Ukes" are young students from the Campbell River school district, ranging in ages from 9 to 17 years. The ensembles are "honour" groups, and students are selected through an audition process based on their musical skills on the ukulele and voice. The "Pursuit of Excellence in Music" is the motivational driving force for these eager and talented young musicians and sets the standard for others to follow.